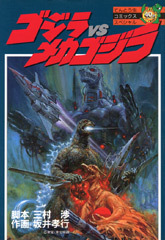 As is customary with author Takayuki Sakai, the graphic adaptation of Godzilla vs. Mechagodzilla 2 (1993) features numerous changes from its film source. Artist and uncredited author Takayuki Sakai, on account that he so wildly adapts Wataru Mimura's script to the point that it takes on a life of its own, certainly has creative and sometimes ahead of his time ideas. While his early work on the Godzilla character was somewhat restrained to the events of the film, Sakai became increasingly "creative" in his interpretations as time went on. Arguably, Sakai went overboard later on, but this work for the 1993 Mechagodzilla manga strikes a good balance in thinking outside the box while still conveying some of the sentiments and sequences of the source material. First off, either by coincidence or as direct inspiration, the manga's story shares a lot of similarities with Godzilla Against Mechagodzilla (2002). This is apparent right away when Mechagodzilla "runs wild" during a demonstration. However, where as the 2002 film has the character running wild because of its cross genetics with the original Godzilla, this manga instead has the programming of Mecha-King Ghidorah slowly taking over. The concept pays off in a brutal showdown at the story's end where Mechagodzilla, now totally under control of Mecha-King Ghidorah's original directive, kills Godzilla by decapitation. If there is one thing to be said, the manga has always been much more brutal towards Godzilla... although this is certainly rough even by those standards. One thing that the book does is give the reader a definitive reason to cheer on Godzilla. In the 1993 movie, the audience is a little sidelined on if they should be rooting for Godzilla or Mechagodzilla during the final conflict. Despite this, it's clear in the movie based on the character reactions after Godzilla is swimming away that we were supposed to be siding with Godzilla without a clear reason why. For the manga, Mechagodzilla runs wild, turning into a lethal and brutal force that kills Godzilla and gets ready to kill Baby Godzilla before Rodan intervenes. The reader is pretty clear and in sync with how they should be feeling about the conflict in this book. Another thing that has changed a lot in the adaptation is Rodan, who is night and day from his movie appearance. In this book, the character takes on a role more befitting Mothra. The monster goes out of his way to never harm any of the humans, and acts as Baby Godzilla's sworn protector. The much more docile Rodan, who is even more of a push over in terms of power here as he is given a serious wound by a helicopter's machine guns, is at least treated with a lot of respect under Sakai's watch... even though the character feels nothing like the hardened anti-hero that the character was best remembered for in the Showa series. As a more global view of the plot, the pacing here is generally better than the movie, moving along at a good pace with dynamic sequences, such as the energetic underwater battle between Godzilla and Mechagodzilla near a sea of underwater volcanoes... yes the sequence is similar to the one in Godzilla vs. Mothra (1992) with the Battra Larva, but this time the stakes feel higher with the Mechagodzilla crew down there. However, for whatever praise one can give the pacing, the characters suffer here a lot. In fact, they run the gambit of manga-like, over the top cliches. Azusa Gojo suffers the most, screaming like a banshee one moment before telling a character how much she likes them. The rest aren't much different, none of them feeling like real characters with everything over exaggerated. About the only character based in normal reflection is Commander Kuroki, the general from Godzilla vs. Biollante (1989) who was added to the story and would become Sakai's calling card for his manga work. In terms of artwork, Sakai is mostly consistent here. Godzilla isn't draw with distortional muscles as often as he is in the manga both before and after this one, while Rodan is always drawn with a great level of detail. Mechagodzilla has a very different look from the movie, being more square and rough like the original concept poster rather than the round look in the film. The human characters also look nothing like their counterparts in the movie... except Kuroki. The second the man walks into panel, the nod to the original character is clear which comes as a welcome surprise to anyone first reading the book who is already familiar with the movie's story since his inclusion is more or less a surprise. Overall, the manga does a lot of things better than the movie, but also a lot of things for the worse. It's similar enough to still feel like it belongs to the source material, while being different enough to be worth a read to fans regardless to see Sakai's take on the 1993 film.